The making of ‘chusen’ tenugui. 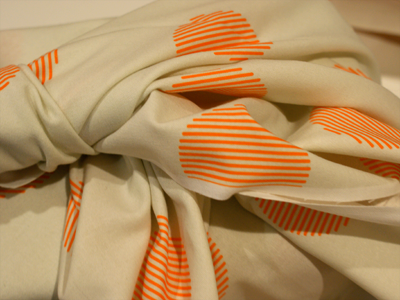 Tenugui is simply described as – ‘a piece of dyed cotton cloth’. 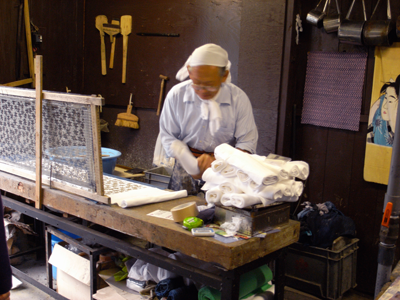 Although tenugui date back to the Heien Period (AD 794-1192), the ‘chusen’ dyeing technique still used by today’s craftsmen, was devised in the Meji era (1868-1912). 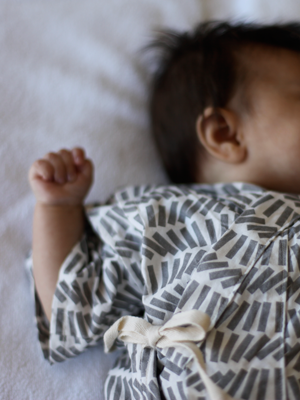 This technique is as unique as the tenugui designs themselves. 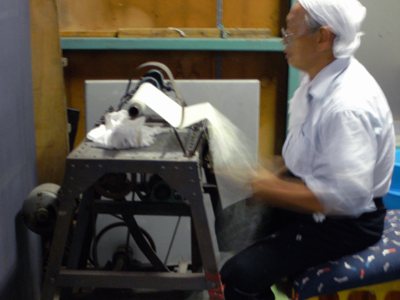 Tenugui are dyed by hand, resulting in an inconsistency in the colour and pattern of each piece. 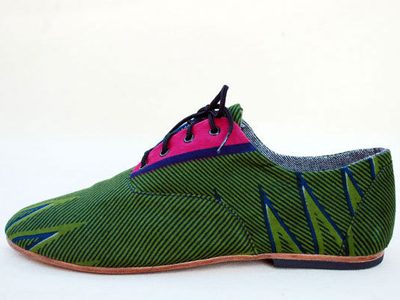 The design permeates the fabric, so that it can be seen clearly on both sides and as the colour fades with use and age, the cotton acquires its unique soft texture. 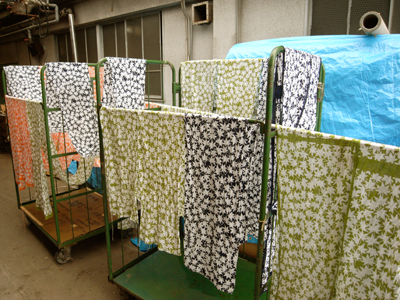 Just before I left Japan I had the amazing opportunity to attend a tenugui workshop for a day, learning the dyeing technique with the company Tokyo Wazarashi (a Tokyo based company that make tenugui). 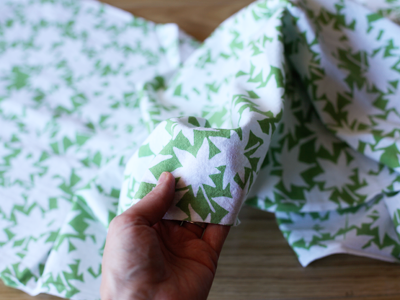 Since our workshop focused on the dyeing process, our class was supplied with ready-made paper patterns to use. Here I’m posting photos I took during the workshop I attended (bad quality photos unfortunately, but they give you an idea). 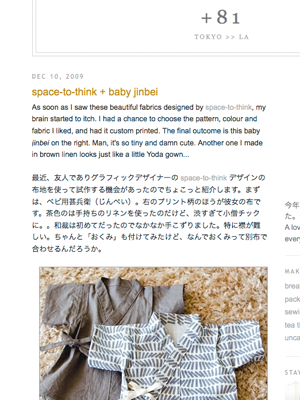 The descriptions are put together from what I can remember from the class, combined with references from a brilliant little leaflet that recently came to my rescue, produced by Kamawanu Co Ltd (my favourite tenugui brand). The information I’m posting is as accurate as I can make it at this time, however bearing in mind I’m not Japanese, I apologize if I have misinterpreted some details. Any corrections are welcome! 1. 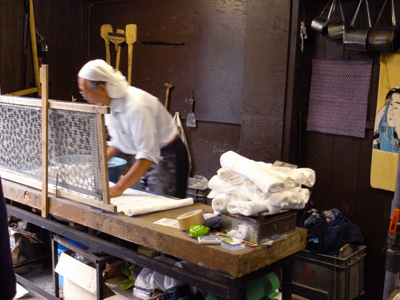 Fine paper patterns are made on ‘bitter paper’ (made up of several layers of Japanese paper, painted with the bitter juice of the persimmon). They are carved by hand and covered with a film of gossamer (fine mesh), which makes them durable enough to withstand repeated use. 2. 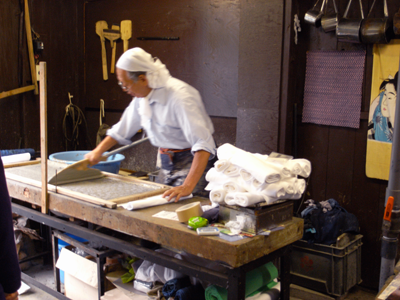 Rolls of bleached cotton cloth (approx 34 cm wide) are prepared. 3. 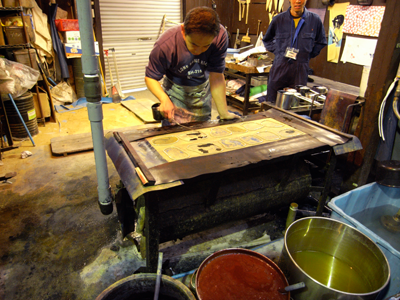 The first piece of cloth is rolled out flat on the printing bed. 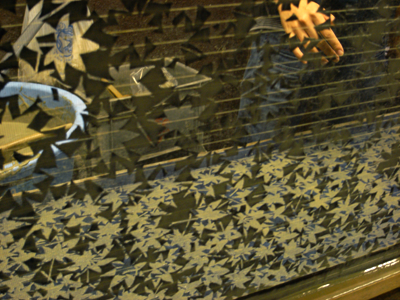 The paper patterns are mounted as screens, and then lowered onto the fabric. Using a starch paste made from a mixture of clay and seaweed, the inverted pattern is printed on the first 90 cm section of cloth. Then the screen is lifted. 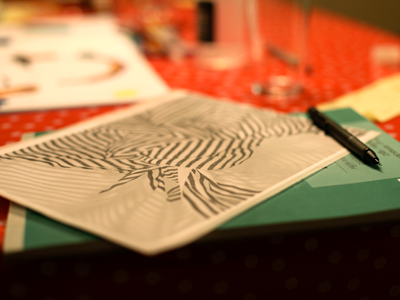 This process is much like screen printing. Then the next 90 cm section from the roll of unprinted cloth is rolled out on top of the previously printed section and the process is repeated, until many layers of cloth have been printed with the starch paste and sandwiched together. 4. 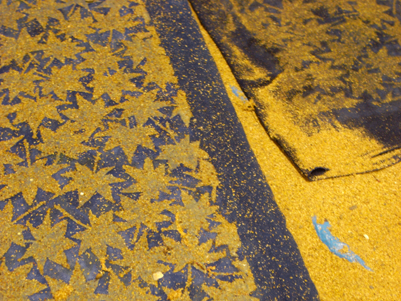 To help keep the starch print in place on the layered cloth, it is laid on a flat surface and covered in sand. 5. 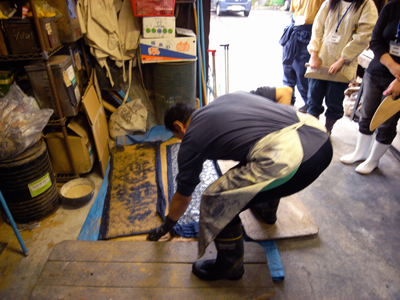 Then the layered cloth is placed on a special dyeing bed. 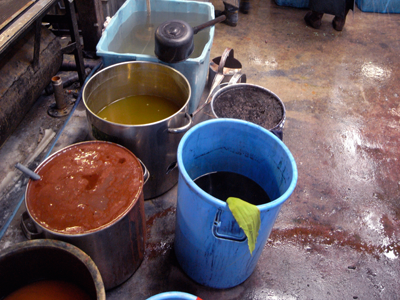 Dyes are poured onto the surface of the starched textiles and sucked from below by a compressor. 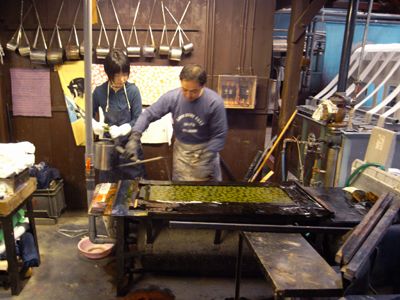 Dyes are also poured onto the reverse side, which helps let the dyes permeate through the textiles, resulting in the tenugui’s characteristic quality of the pattern on both sides. 6. 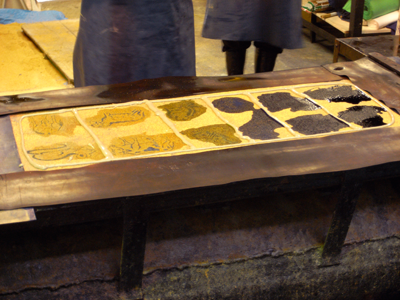 If many colours are used, a mound is formed by pouring a trail of paste around each area to separate the dyes. 7. 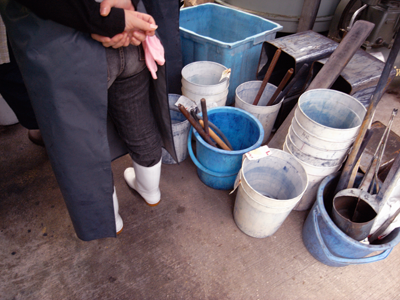 The textiles are then vigorously washed, which opens them out and removes the starch and extra dye. 8. They are then hung to dry in the sun. 9. 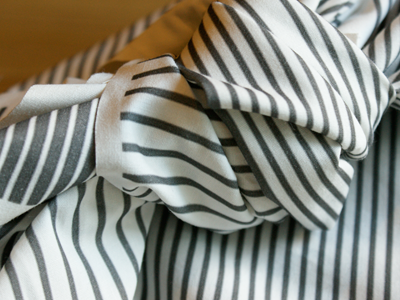 Once dry, the textiles are put back on a roller and folded into 90 cm lengths once again. The wrinkles are rolled out and then they are cut into individual pieces. 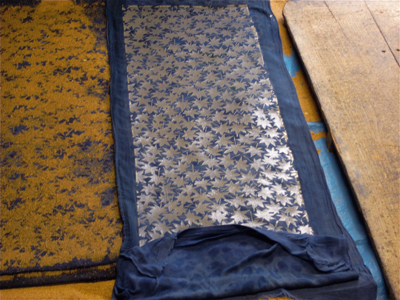 Both ends of a tenugui are left unfinished. 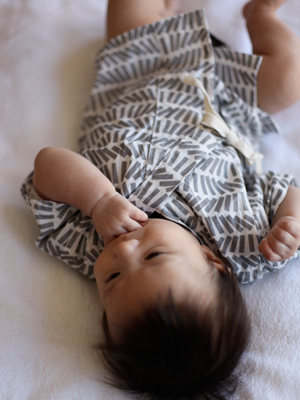 Some more pictures of the lovely little jinbei my friend Keiko made out of some of my fabric, beautifully modeled by little A! 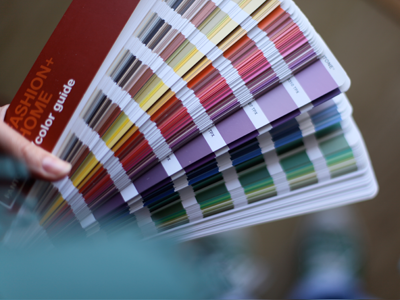 Fashion and Home Pantone book. 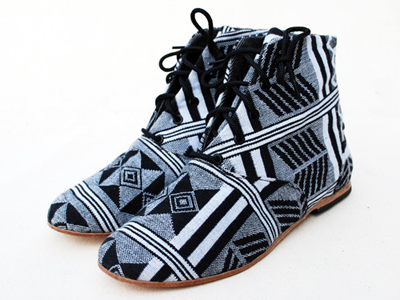 Way too expensive … but ready to go! 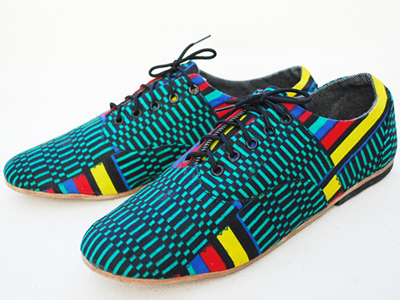 Osborn Shoes – designed in Brooklyn by Carla Venticinque-Osborn & Aaron Osborn, these very unique shoes are handcrafted by artisans in Guatemala City. The fun and beautiful fabrics range from hand blocked Kente cotton fabric, to thick woven cotton from India and almost certainly some Guatemalan fabrics in there too. Wow. I’m not a big fan of tie-dye, but I think this sweatshirt by Aiko is beautiful. Take a look at +81. 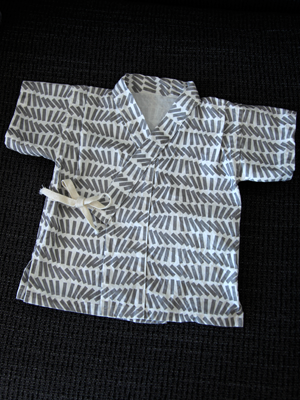 Keiko made this really lovely tiny jinbei for her new born daughter using some space-to-think fabric. 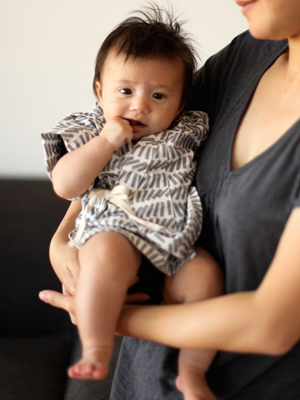 It makes me so happy to see this fabric being so beautifully used. 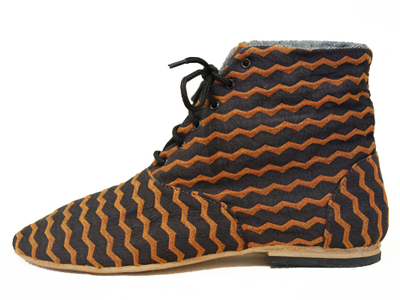 I can’t wait to see it being worn … more pictures to come!